It’s a rare occasion when we are granted full access to a client’s wedding album rather than a few picked images. When we get to look through all of the pictures, we get to experience their wedding on a different level. Aside from being able to dress them and seeing the traditional group shots of the wedding parties, we get to see the ceremony and reception, the details of the reception and the progression of the night. One of our lovely, lovely clients has granted us this gracious access, Tanya Cashorali. 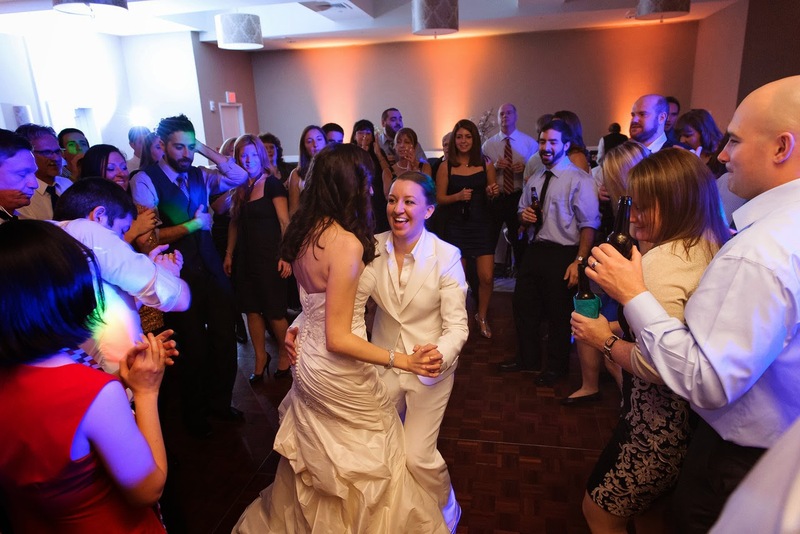 Please enjoy a glimpse of her matrimonial day with her partner, Stephanie, as much as I did. I wanted the suit to be absolutely perfect, both in style and comfort sense. I knew I wanted something traditional, off-white and sleek. Suits for women can be a hit or miss and so, I knew that it needed to be designed custom for me in order to look good! There are too many to name, but seeing everyone cheer and looks o happy while we were announced as a married couple for the first time is definitely something we will never forget. We went for a classic look and feel with a few modern touches. What Is Your Best Style Advice to Grooms and Brides Looking For Wedding Suits? Make sure you feel confident and attractive in whatever you decide to wear. If you don’t feel comfortable in your suit or even shoes, that will show in your wedding pictures. Go through ever detail possible during the design process and then let your confidence take center stage when you put on your custom suit on your wedding day. Does your partner want to compliment your gown but with a suit? Interested in getting that special tailored look you can’t find off the racks or a suit that fits right for a special occasion? Contact a style consultant at info@9tailors.com. As a reminder, we are still having our April Promotion of Buy a Suit, Get a Shirt!